When Elie Hirschfeld and his wife Dr. Sarah Schlesinger visited Rome to meet the Pope in January, they were so taken by the warmth of the Jewish community in Rome. Today they announced a $18,000 to the Jewish Community of Rome. New York, NY, March 07, 2016 --(PR.com)-- Philanthropist and Hirschfeld Properties president, Elie Hirschfeld was deeply moved by his trip to the Great Synagogue of Rome and is commemorating the event by donating $18,000 to Rome’s Jewish community. 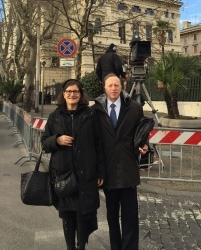 Both, Hirschfeld, and his wife, Sarah Schlesinger, MD, represented Park East Synagogue and Rabbi Arthur Schneier at Pope Francis’ historic trip to visit the Great Synagogue of Rome last month. The papal visit was a significant showing of Catholic-Jewish friendship and the Hirschfelds were inspired by the momentous occasion. The Roman Jewish community has existed since early Roman times, despite repeated acts of persecution. Today, the community is small but dedicated, even as anti-Semitism spreads across Europe. Hirschfeld’s donation brings awareness to the struggles of Jews in Europe today as well as shining a light on interfaith efforts promoting peace and unity between communities and religions.